The phone rings or makes a noise signaling you to an incoming call. The sound you hear when the phone rings is known as the ringtone. You can configure the Droid X to play a number of ringtones, depending on who’s calling, or you can set a universal ringtone. The touchscreen display turns on, giving you more information about the call. The contact picture, such as Mr. Clemens, appears only when the person calling is in your contacts list and you’ve assigned a picture to that contact or the picture has been imported from your social networking sites. Otherwise, a generic silhouette icon shows up. Answer the call. Slide the green Answer button to the right. Then, place the phone to your ear or use the headset, if you have one attached. Ignore the call. Slide the red Decline button to the left. The phone stops ringing, and the call is immediately sent to voice mail. Silence the ringer. Touch the volume button (up or down) to silence the ringer. If you’re already on the phone when you receive an incoming call, you hear a tone. 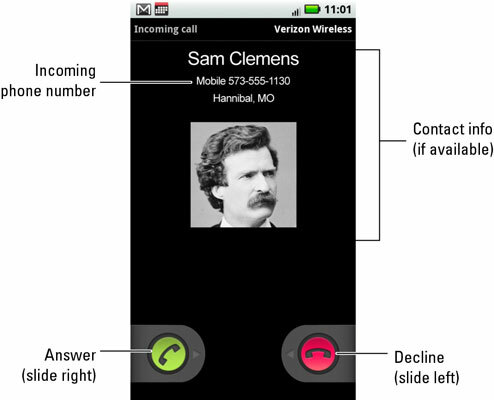 At that point, the touchscreen displays information about the incoming call, and you can answer or ignore the call. When you choose to answer, the current call is placed on hold.